"Imagine How Quickly Your Technique Would Improve If You Could Watch and Learn From A Professional Ballerina Whenever You Wanted"
Due to popular demand... The Ballet Bible Video Demonstration Series is now available! "The Perfect Resource for New and Intermediate Ballet Students"
"It's As If You Had Your Very Own Personal Ballet Instructor Guiding You Through Every Movement and Gesture"
Hi, my name is Anita Leembruggen and I am the author of the popular online Ballet Bible. I have been teaching ballet for many years and one of the biggest problems I see that stops talented students from reaching their potential is the lack of contact time they have available with their teacher or the lack of good educational resources to help them practise and develop correct technique on their own. Typically, most students have one ballet lesson with their teacher each week and by the time next week comes around they have naturally forgotten a lot of what they learned the previous week, which means the teacher has to constantly go over the same things again and again. You can see how this ends up costing a lot of money and time spent on repeat lessons for little overall improvement in the students technique and understanding of ballet. The other problem is that during a 45 minute class of 5 to 15 students, usually the teacher doesn't have time to give each student the individual attention they need and still get through the whole lesson plan. Naturally some students progress faster than others meaning those that don't keep up may never have the chance to reach their potential because they missed the opportunity to fully grasp fundamental aspects that are crucial to correct ballet technique. This is why I have put together the online Ballet Bible Video Demonstration Series. This series is designed to compliment the ballet teacher's work and give an extra edge to students wishing to accelerate the speed at which they learn ballet and really get somewhere in their career or in their personal development faster than otherwise possible. If you are a new ballet student or an intermediate ballet student you will be amazed at how quickly this series will help you reach your full potential. Can you imagine how much your ballet technique would improve if you had 1-on-1 access to a ballet teacher 24 hours a day, 7 days a week? You get to watch a professional ballerina perform each exercise. You get to listen to each movement explained with in-depth technique analysis. You get to playback each lesson as many times as you like until you are confident you have mastered the techniques yourself. I have specifically divided the 78 individual exercises into 12 progressive lessons. This enables you to start at lesson 1 and master each exercise before proceeding up to the next level. 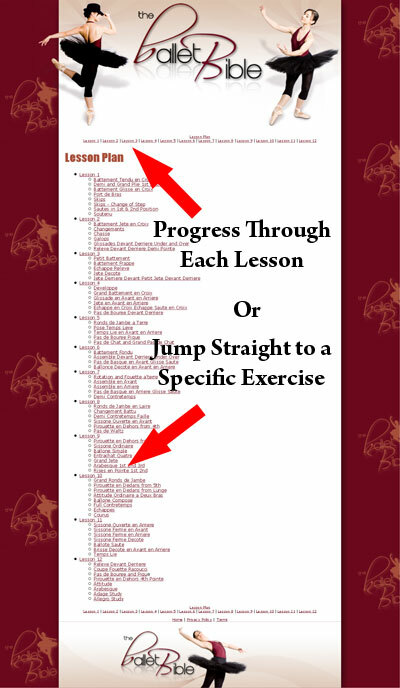 If you are currently taking ballet lessons then you can also use the quick link menu to jump straight to a specific exercise that you may be doing in class with your teacher. This way you can practise at home and rapidly accelerate the speed at which you progress with your teacher, blowing them away each week with your improved technique and confidence. Complete All 12 Lessons Including The Final Adage And Allegro Studies And You Will Be A Prime Candidate For The Professional Ballet Arena! A fantastic benefit to learning with the Ballet Bible Video Demonstration Series is that you get to learn at your own pace in the comfort of your own home. You don't have the pressure of keeping up with everybody else in the class. You actually get the chance to take your time with each exercise and think about what you're doing. This is when you get those "aha" moments and you suddenly realize exactly what you have been doing incorrectly and you instantly understand things like why your teacher has been nagging you about keeping your hips down, or elongating your neck, or fully extending through a movement. The Ballet Bible Video Demonstation Series gives you the opportunity to repeatedly visualize each exercise performed correctly. This will help you subconsciously train your mind to recognize correct technique in your own dancing. Also, by listening to my clear step-by-step explanations about the correct body positioning, the muscles you should be activating, the common mistakes students make, and the focus of each movement you are going to see an enormous improvement in your understanding of ballet technique and your ability to master new movements as if you had been doing them for years. Use this Package as a Study Tool in Between your Ballet Classes, or use it as a Reference Guide when you're Practising so that you are Constantly Learning the Things that Comprise the Correct Technique. Each lesson contains 5 to 8 individual exercises designed to help you learn groups of related movements and gradually increase your overall technique as you master each new exercise. If you are a teacher reading this, then imagine how much more your students will progress and look forward to class when you don't have to keep picking them up on the same old things all the time. Now you can focus on choreography and the fun stuff rather than always having to go over basic fundamentals and repeat technique lessons because students have forgot or haven't practised. Now students have a resource and a reason to practise outside of class. The Ballet Bible Video Demonstration Series makes it fun to learn at home and you can rest assured that when they practise with The Ballet Bible Video Demonstration Series they won't be developing bad habits because they are unsure of something. They will always have the correct advice and visual reference to follow along with. If you are a parent reading this then judge for yourself how much of your money and your child's time is spent re-learning basic techniques in class when it could be spent learning performance routines or advanced lifts and partner work. I'm sure that you would much rather see your child as one of the star performers in the end-of-year concert rather than one of the fill-in kids at the back who skip in circles and do a few chasse's here and there because that's all they managed to learn during the year. You've Heard Enough... Are You Ready To Join The Club And Gain Unlimited Access To The Ballet Bible Video Demonstration Series? "You Will Absolutely Love this Hot New 12 Lesson Video Series Containing Over 70 Individual Exercises Complete with Voice Over Instruction and In-Depth Technique Analysis!" Most teachers charge anywhere from $12 to $14 dollars upwards per lesson. Let's keep the maths simple and say you managed to find a teacher who charged only $10 per lesson for 12 lessons. That's still $120 for a maximum of 12 hours teaching whether you pickup the techniques or not. That's also assuming the teacher is actually any good and at that price you will definitely be in a class of at least 5 - 10 students meaning you are not going to get the full benefit of that teachers time.That's time paid for that you will never get access to again. With The Ballet Bible Video Demonstration Series you get unlimited access to all 12 online lessons and you can repeat them as often as you like. I'm not suggesting you don't bother with ballet classes but rather use The Ballet Bible Video Demonstration Series to help you practise in between lessons or as a study tool to help you quickly understand ballet technique and get off on the right foot so to speak. You may like the idea of learning at your own pace in your own time. You may be a teacher looking for resources and training material to use in your classes. You may be a parent looking for a way to help your child learn and develop their ballet skills faster. You may be an adult beginner daunted by the thought of actual ballet classes and want to get a head start. The Ballet Bible Video Demonstration Series is Perfect For You! I want you to be completely satisfied, that's why I'm giving you a Risk-Free, 8 Week 100% Money-Back Guarantee. 1. ASK FOR A REFUND AT ANY TIME WITHIN 8 WEEKS. And a check is on its way to you - for the full amount. 2. KEEP EVERYTHING I'VE SENT YOU. Keep the entire package. It's all yours FREE forever! That's how serious I am. I can't be any fairer than that. I understand that this purchase entitles me to Full Online Access to The Ballet Bible Video Demonstration Series 24 Hours a Day, 7 Days a Week. I further understand that my purchase is protected by your 100% Money Back Guarantee. I know anyone would have to be flat out insane to pass on this incredible deal. On That Basis, Let Me In At This Special Offer Price Of Only $197 $97 For My Personal Access To The Ballet Bible Video Demonstration Series. All This For Only $197 $97! The Ballet Bible Video Demonstration Series is a digital product delivered as an instant download. Once your order has successfully been processed you will return to onlineballetlessons.com for immediate download.